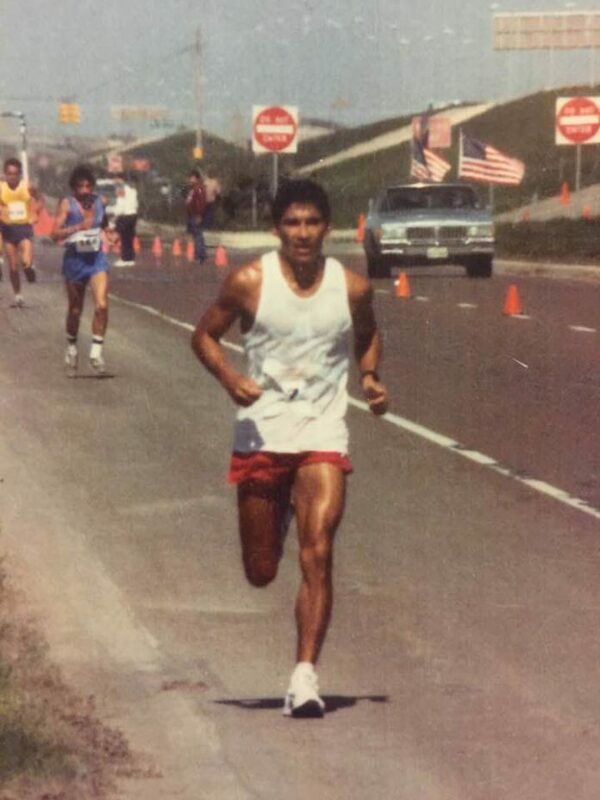 David Chavana is seen running the All-America City 10K race in 1987. EDINBURG — For David Chavana, a 4:30 a.m. alarm and a fresh pot of coffee is how he begins his day. At 65, the founder of the All-America City 10K, which will be run for the 36th year Saturday, has no intention of slowing down anytime soon. The longtime Edinburg resident became an active runner early in his life, signing up and participating in races in San Antonio, Austin and Houston and around the state. It was during times on the road that he decided he wanted to start something similar back home. So in 1982, when Chavana began working with the parks and recreation department in Edinburg, he decided to make a change and begin a race in his hometown. In the fall of that year, Chavana along with Frank Garza, the former parks and recreation director, and local attorney Mick Sawyer began the development of the 6.2-mile race. After almost four months of planning, the first All-America City 10K race was run in February 1983 with 253 participants. The first Edinburg winner was Orlando Cantu. That same year, Chavana became an educator in the Edinburg school district. As the years continued, he learned to sway back and forth from being a full-time educator to also being race director. In the first five years, the majority of the runners were local from the community and surrounding area. He was still participating in the runs throughout the state and during that time, and would invite people to run the race in Edinburg. “I would recruit people to run in the 10K,” he said. Word spread and in the late 1980s he saw the race evolve and begin attracting runners from out of the area. In 2012, he decided to retire as race director to focus on family as his children were getting older and didn’t want to miss anything. Since he retired, runners from Morocco and Ethiopia have also joined the field of the race. He has also seen a rise in the number of female participants in the 10K. In 2002, a fun run was created for younger children because Chavana and other members of the planning committee noticed that the children couldn’t keep up with the adults. About four years ago, the Miracle Mile began and takes place on the track of Richard Flores Stadium. The race is for those with special needs, wheelchairs or walkers. Chavana said the Edinburg 10K is all about family. In his personal time, he is still very active in the sport, usually running six days out of the week and running from three to five miles per week.